PLEASE NOTE: A typical itinerary to the Antarctic Peninsula is illustrated below. This itinerary is for guidance only. Programs may vary depending on local ice and weather conditions, the availability of landing sites and opportunities to see wildlife. The final itinerary will be determined by the Expedition Leader on board. Flexibility is paramount for expedition cruises. Average cruising speed for m/v Plancius is 10,5 knots. 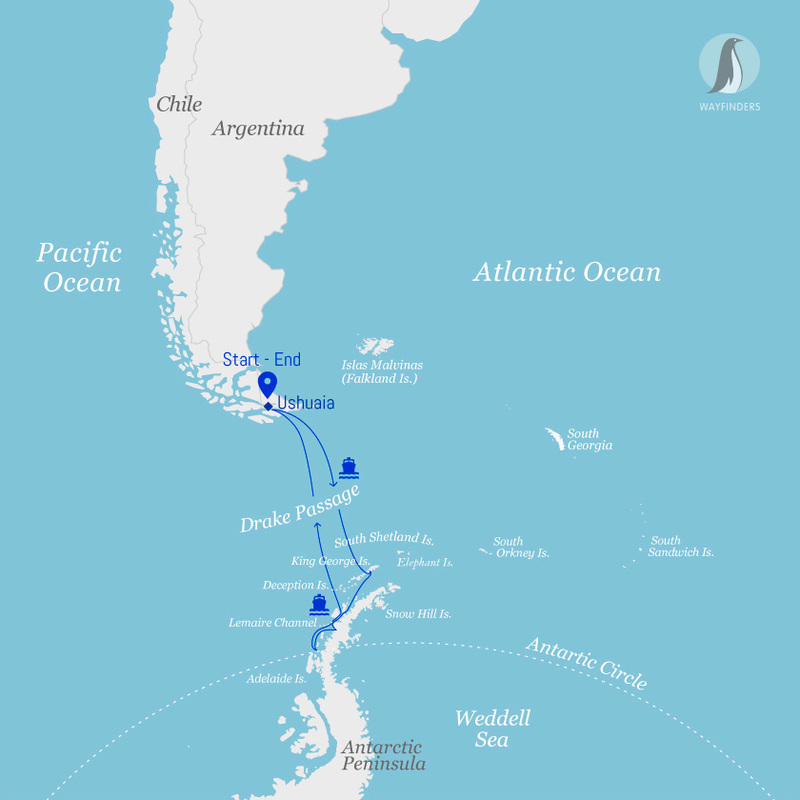 During these two days we sail across the Drake Passage. When we cross the Antarctic Convergence, we arrive in the circum-Antarctic up welling zone. In this area we may see Wandering Albatrosses, Grey Headed Albatrosses, Blackbrowed Albatrosses, Light- mantled Albatrosses, Cape Petrels, Southern Fulmars, Wilson’s Storm Petrels, Blue Petrels and Antarctic Petrels. Near the South Shetland Islands, we spot our first icebergs. We will sail directly to “High Antarctica”, passing the Melchior islands and the Schollaert Channel between Brabant and Anvers Island. We will sail to the Neumayer Channel, where we position our ship for the multi activity basecamp. The protected waters around Wiencke Island will become our playground for all activities. In this alpine environment there are great opportunities to scout the region on foot, per zodiac and during kayak trips. Walkers will find opportunities to use snowshoes on hikes near the shore lines and the mountaineers will find their challenge by climbing hills and viewpoints further inland. All climbs and excursions can only be conducted in good weather conditions.We plan to stay two overnights at anchor in order to implement two camp nights and two full activity days. We will visit the old British research station, now working museum and post office at Port Lockroy on Goudier Island. Close to Port Lockroy we may also offer a landing on Jougla Point with Gentoo Penguins and Blue-eyed Shags. 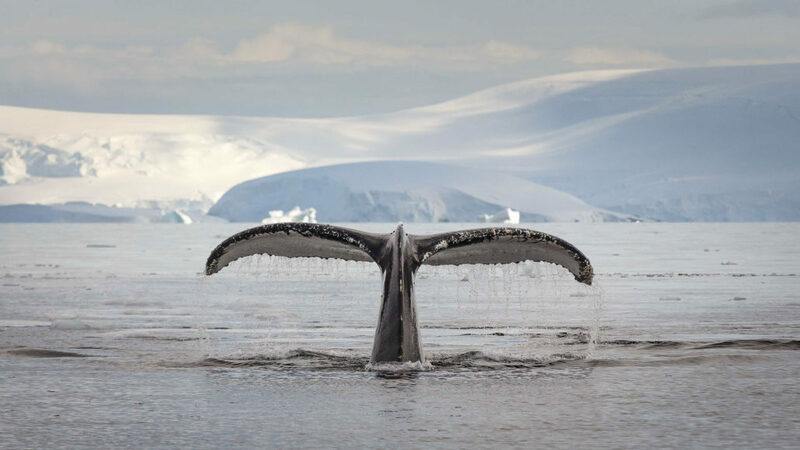 We look out for leopard seals, Crabeater seals and whales.In good conditions and time allowing we sail through the spectacular Lemaire Channel to Booth Island, Pléneau and Petermann Island where we can find Adélie Penguins and Blue-eyed Shags. In this area there are good chances to encounter Humpback Whales and Minke Whales. We choose another camp site which is suitable and close to next day’s activity. The opportunities for kayaking, glacier walks or more ambitious mountaineering are excellent in this area. At Neko Harbour we will have the opportunity to set foot on the Antarctic Continent in a magnificent landscape of huge glacier and enjoy the landscape during zodiac cruises, walks and kayak excursions. A small group of glacier walkers may climb up on higher grounds of the glacier. We will spend the night in Paradise Bay with a camp erected ashore. We will leave early morning after breaking our last camp. We will depart from the Peninsula around noon when conditions on the Drake Passage (weather and sea-conditions) are predicted as unfavorable.